Another day of blue skies and sunshine! Another marvellous walk. When we reached this collection of boulders it seemed like a fine place to stop to admire the view. Actually, when the others reached this collection of boulders, I presume that it seemed like a fine place to stop to admire the view and wait for Tail-End Charlie, i.e. me. When I finally caught up, I declared my intention to spend the remainder of the day there, or thereabouts, sunning myself, snoozing, taking in the scenery etc.. It seemed like a fine idea, but in the eventually, when the others had set-off, I decided to follow on anyway to see how far I might get. 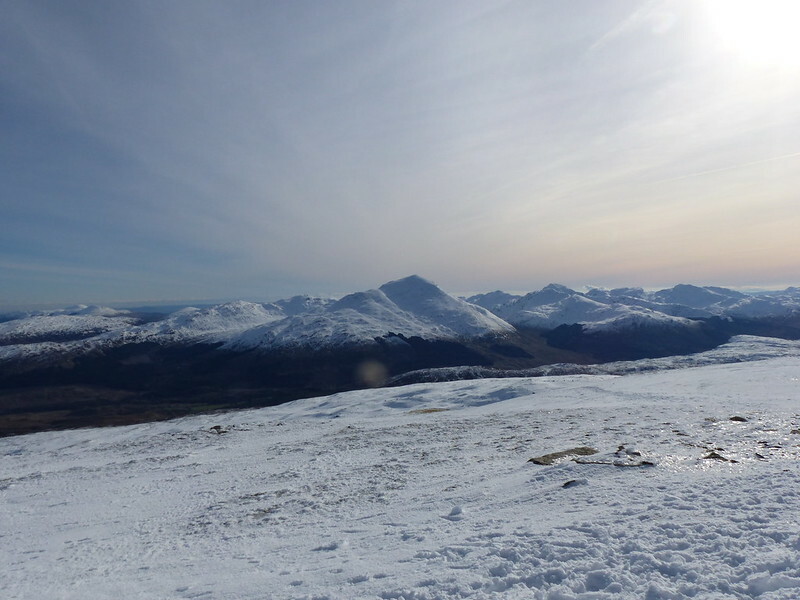 I have a feeling that when I first climbed these hills, many moons ago, there might have been three Munros here, and that one of them has subsequently been downgraded, but I’m too lazy (and unconcerned) to look it up. The rest of the party must have realised that I was still, despite what I’d said, dogging their tracks, like Frankenstein’s creature trailing across the ice, so when they found a snow free patch they waited for me again. By the time I reached the top though, only the Tower Captain was waiting, the rest having gone on. 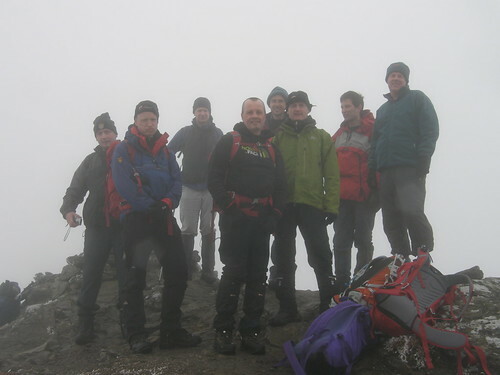 Obligatory summit photo number three. If anything, I think I enjoyed this second outing of the weekend even more than the first. If I’m allowed to quibble, perhaps the views were a little more hazy compared to the Saturday. But I can cope with a little haze! 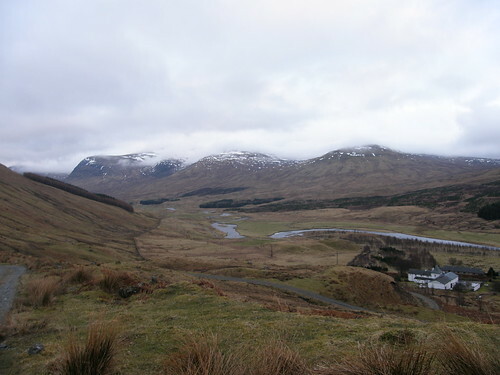 When you book* a weekend away in the Scottish Highlands, at the tail end of winter, months in advance, you are inevitably making yourself a hostage to fortune. 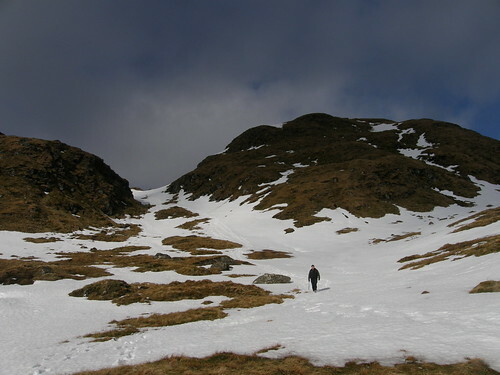 Over many annual visits to the Killin area, our group of old friends have enjoyed quite variable weather, with days out memorable for both fine conditions but also sometimes for some pretty wild and unpleasant wind, rain, hail, snow – not necessarily all at the same time. We have never however, experienced a weekend on a par with this year’s superb trip. Days like these come far and few between. 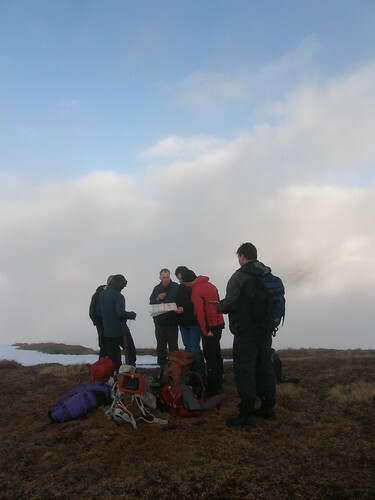 On the Saturday we split into several groups with one party heading for Ben More and another for Beinn Dorain. 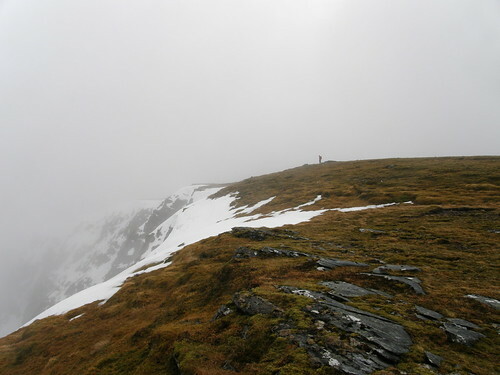 The Tower Captain and I meanwhile opted for the two ‘spare’ hills at the North-Western end of the Ben Lawers range. 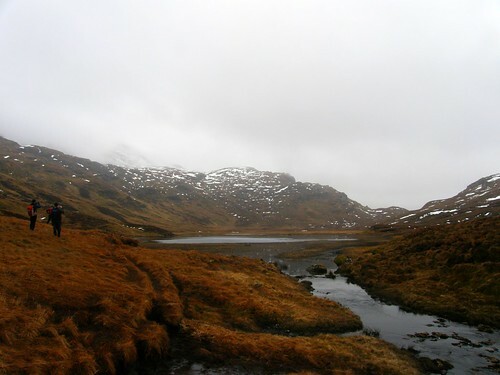 This has the advantage of a very high start, although the road past Lochan na Lairige eventually became impassable and we first helped to push another car which was stuck and then had some dodgy manoeuvres of our own to negotiate before we found a good place to park off the road. I took lots of panoramas. All of them, to a greater or lesser extent, have these vertical lines across them, but I’ve included them anyway because I think they give a better idea of the views we had. 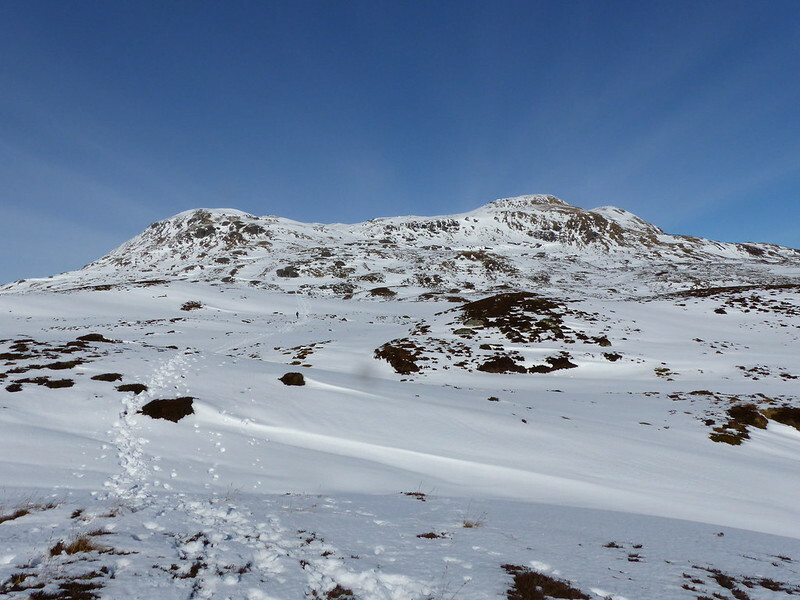 We had to descend a little at first, in order to get to a point where we could begin our ascent of Meall a Choire Leith. That climb was a long old drag (much bigger than Arnside Knott! – see last post) and to say that I was very tired by the time we’d finished it, is somewhat of an understatement. The snow was pretty hard in places. On a previous trip the Shandy Sherpa lent me his Kahtoola Microspikes and, impressed with their efficacy, I bought myself a pair almost immediately afterwards. I haven’t worn them in the two years which have elapsed since, and for some reason didn’t put them on as soon as I might have on this occasion either. When I eventually did fit them, I again found they gave great assurance and wished I’d put them on sooner. 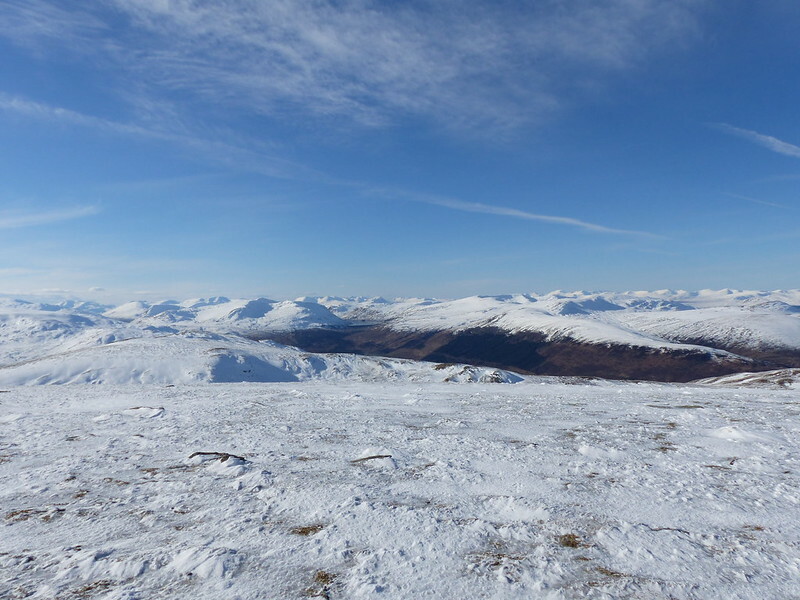 …with ranks of snowy hills stretching away in every direction. …seemed to have paused to contemplate the majesty of it all. Obligatory summit photo number one. 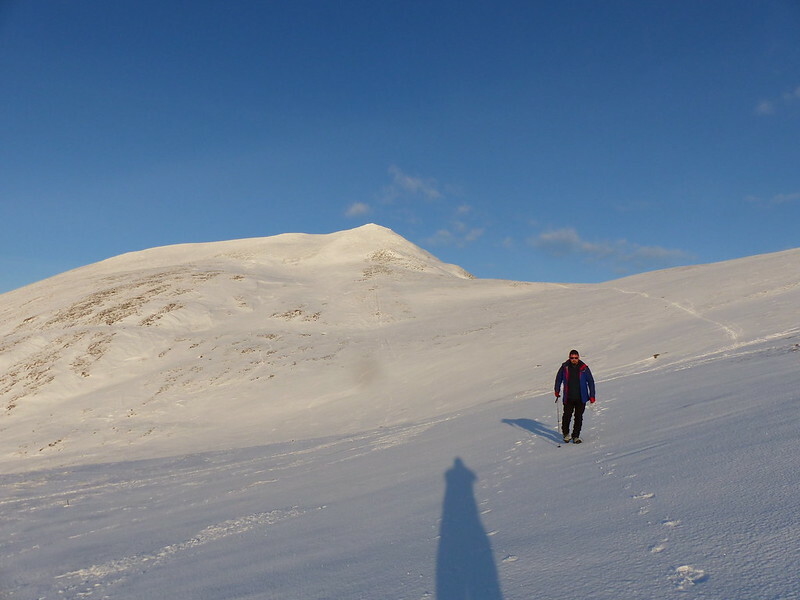 We did some hasty mental calculations and decided that, even at my slow plod, we still had plenty of time to include Meall Corranaich. 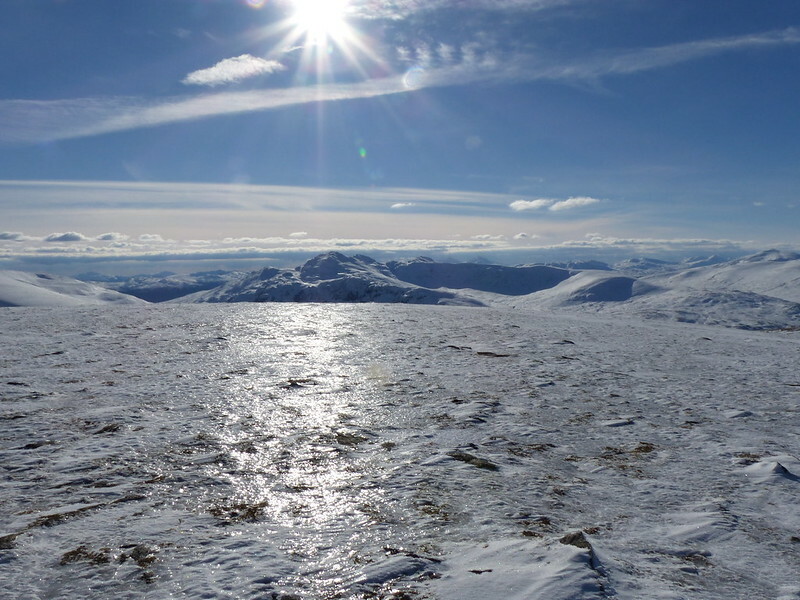 Looking back to Meall a Choire Leith. 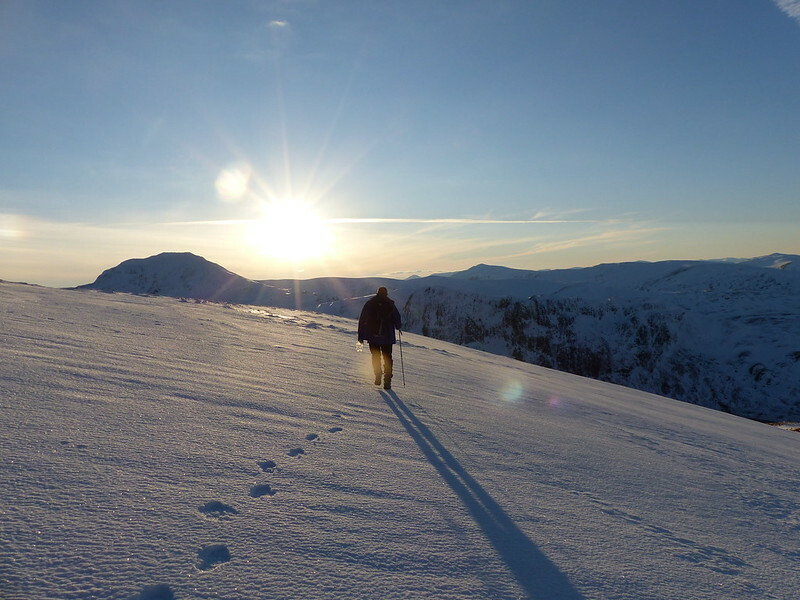 The climb was long and gradual, and should have been relatively easy, but for, in the latter stages, some energy-sapping, deep, unconsolidated snow. Obligatory summit photo number two. Click on any of the photos to see larger versions. 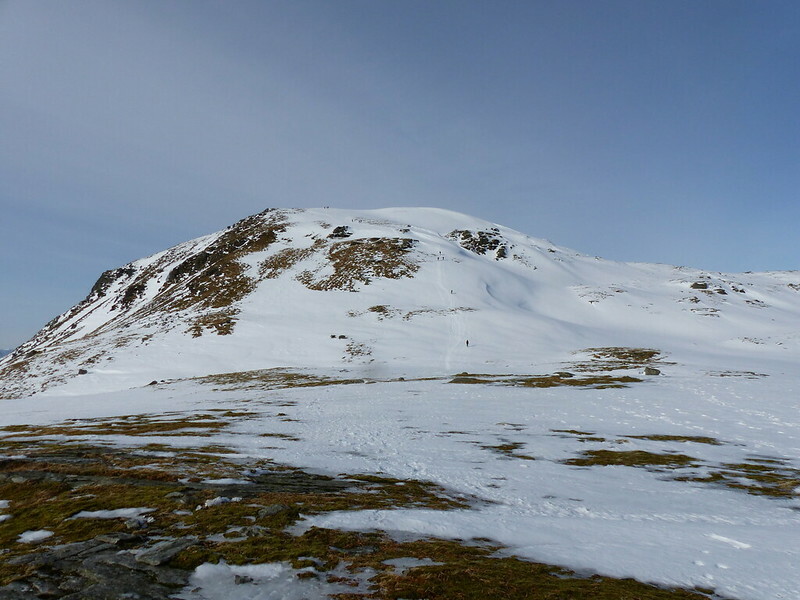 (Soon to be) obligatory summit panorama. 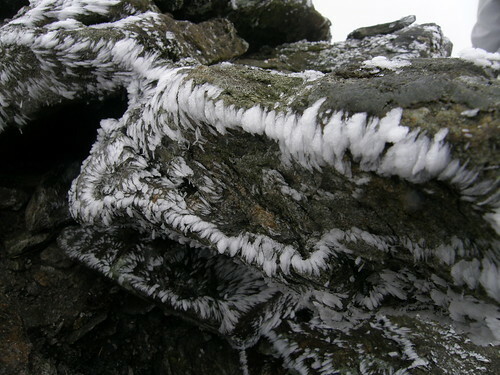 TC was wearing his own crampon substitutes which seemed to have coiled wire rather than spikes. They worked well, but had an unfortunate habit of coming off from time to time. 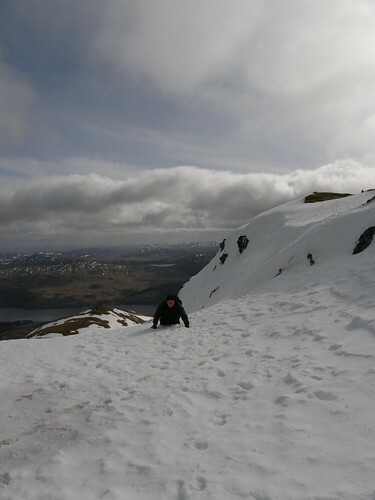 Here, on our descent, he had just retraced his steps and luckily managed to retrieve them both. 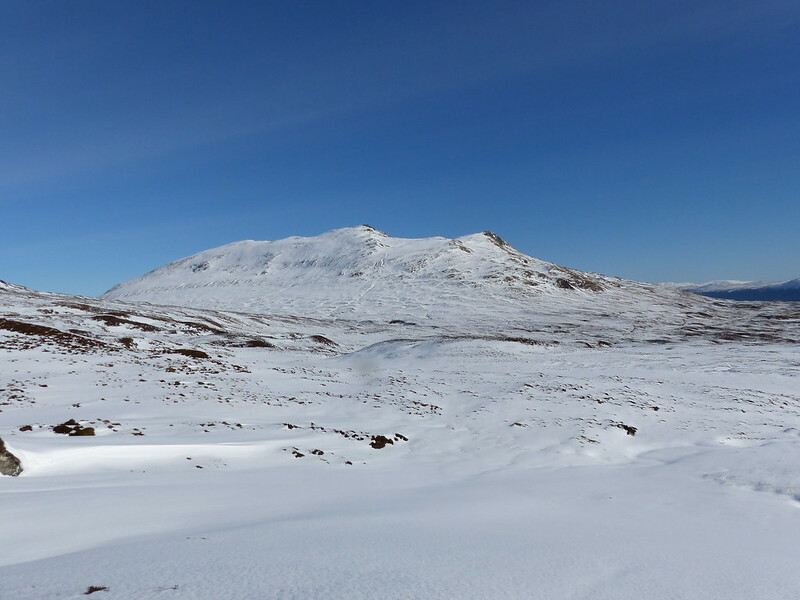 A final view of Meall a’Choire Leith and our ascent route. Fantastic. All that, and we still had the prospect of a delicious meal and a few convivial beers in the bar of the Suie Lodge Hotel to come. *Not that I booked it. Thanks to the Shandy Sherpa for that. This is (I think) the sixth year that we’ve stayed at the Suie Lodge and it may, sadly, be the last, since the owners have it on the market. The warm welcome and great food there are highly recommended, catch it while you can! 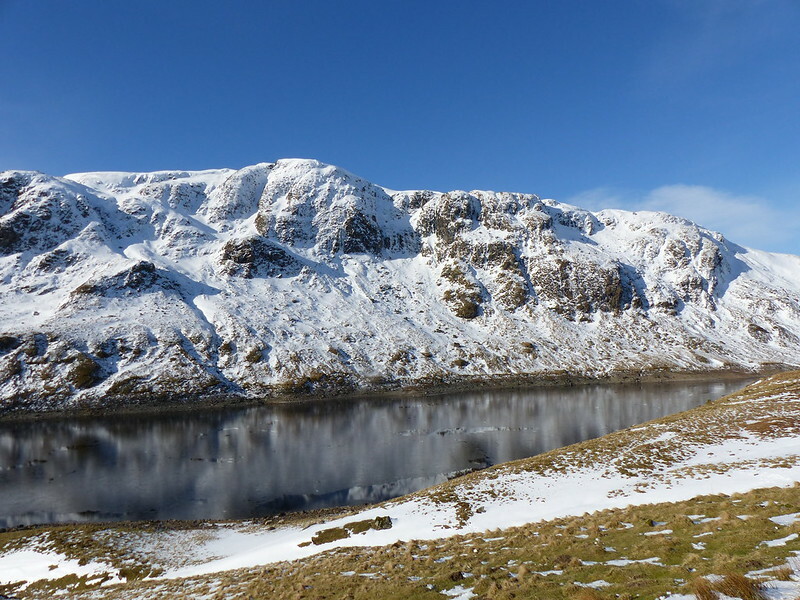 We skirted around the lochan and then picked our way through the crags so that we could traverse the ridge from East to West, only finding a faint path as we neared the summit, but finding a good path from that point on. Unlike the day before, the cloud offered no promise of respite. 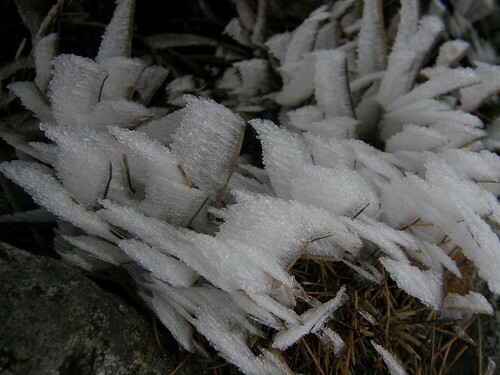 There were flakes of snow in the air and everything was rimed with ice. On the way up past the burn I had a close encounter with a black feral goat with very impressive horns, but wasn’t quick enough retrieving my camera from my sack. 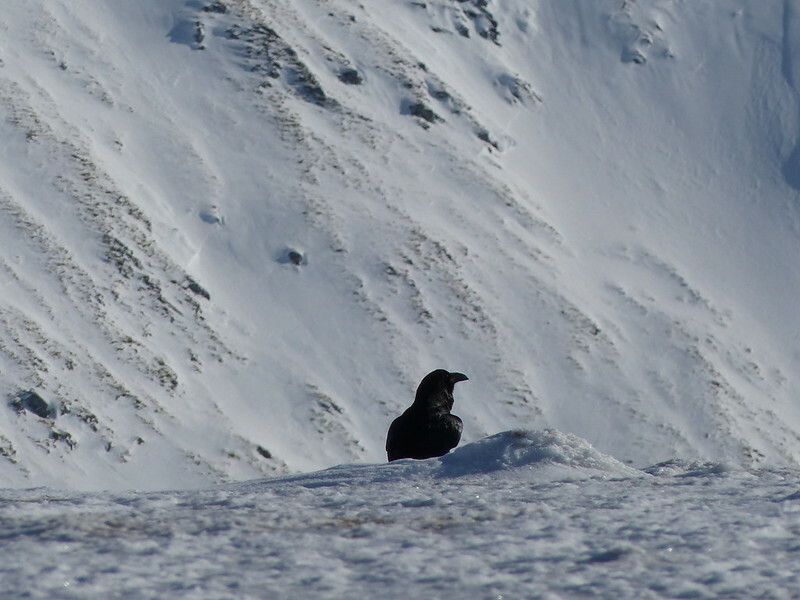 Later I also spotted a solitary ptarmigan. I’ve had another peek at my Munros map since yesterdays post and realised that the total I gave is (not particularly surprisingly) wrong. 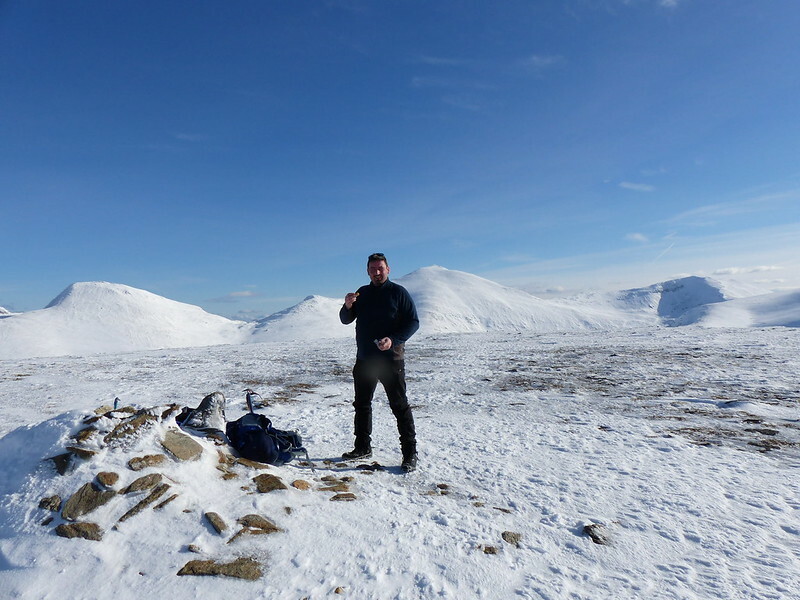 I didn’t count the Monadhliath hills, because they aren’t ticked off on the map, but I definitely did them, on an epic day which I would hardly forget, and I’m afraid that I have absolutely no intention of doing them again. 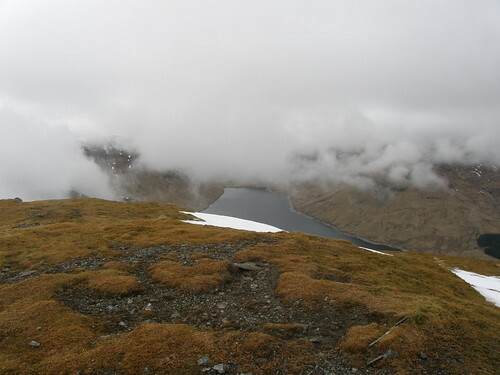 And Ben Cruachan – didn’t I do that once too? Oh well – not to worry. 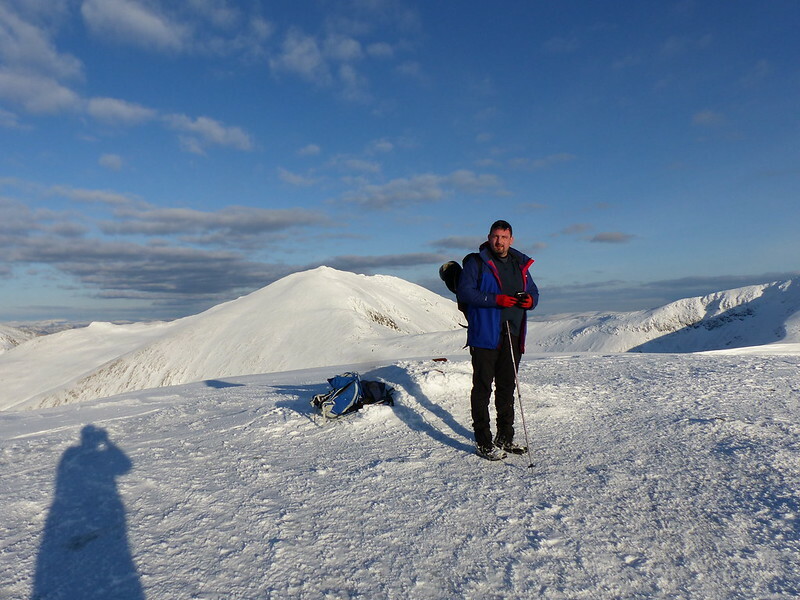 I think that I can safely say that I’ve done at least 150 Munros and possibly more. Meanwhile Robin is now, without doubt on 3 and will probably finish before me, even if that is in the 24th Century. Our annual weekend get together in the Highlands. 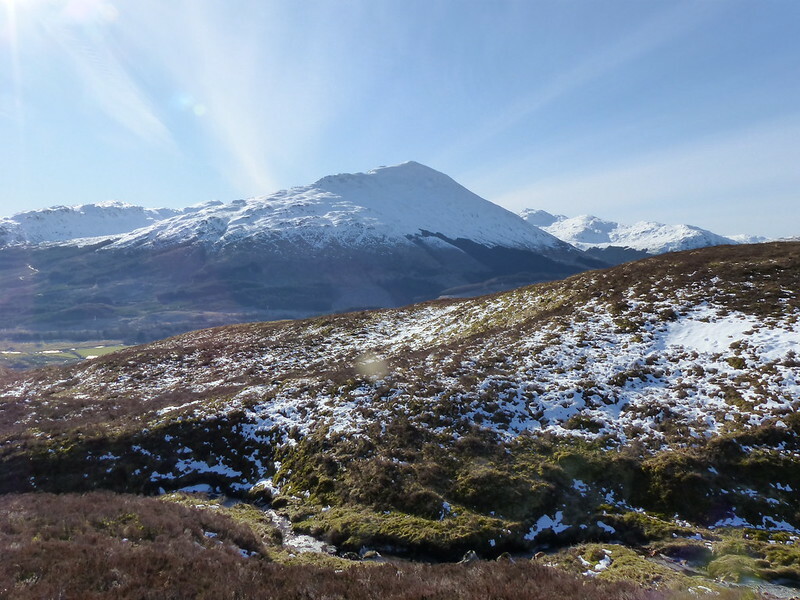 For several years now we have been meeting in Crianlarich for this event, but we decided that it was time to move on, time to ring the changes, go for a change of scene. So this year we booked Suie Lodge in Luib. 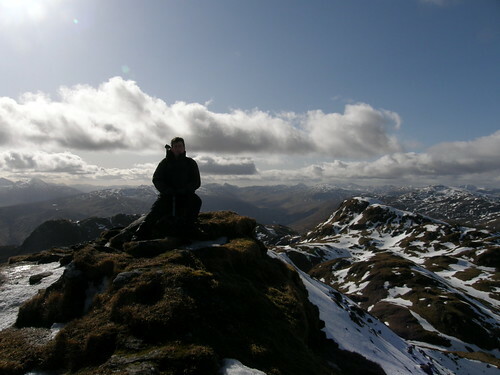 (Just down the valley from Crianlarich – nothing too radical then.) 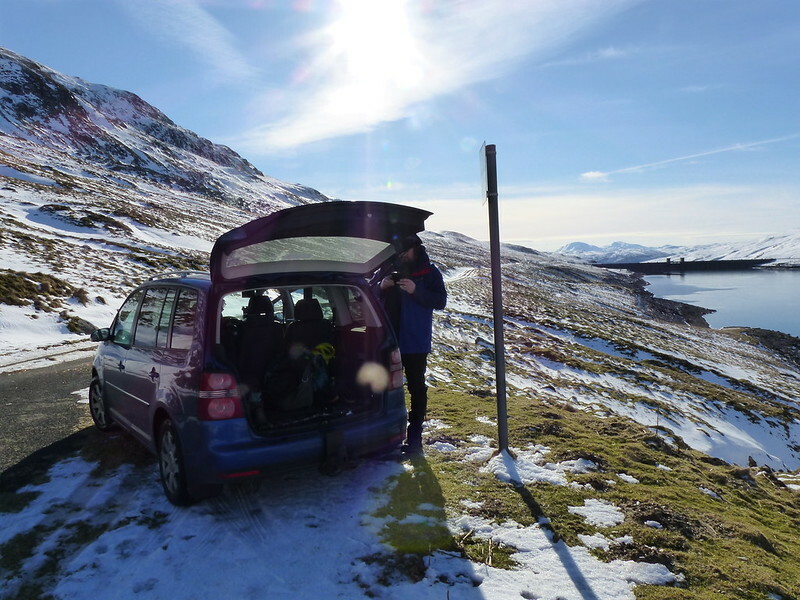 On Saturday morning we drove down Glen Lochay, past road signs warning that this was a no-through route, then turned North on what my (old) map shows as a track, but which newer maps apparently show as a (yellow) minor road. In the event it was metalled, but in places more pot-holes than road and probably not to be recommended. 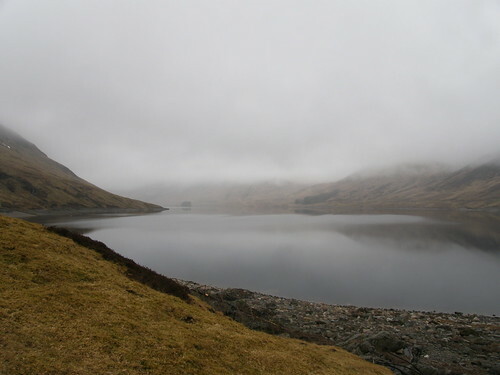 On the far side of the pass, in Glen Lyon, we left a car at Pubil and continued round to park below the dam of Loch an Daimh. This gave us a head-start on our climb, beginning at around 400m, and with a linear route in mind. Looking at the map I had liked the idea of tackling the ridge of Creag an Fheadain, but that would have necessitated following the shore of the loch for perhaps a couple of kilometres, and when we found a well-used path taking a more direct line up towards the top of that ridge at 887m it seemed sensible to follow it. 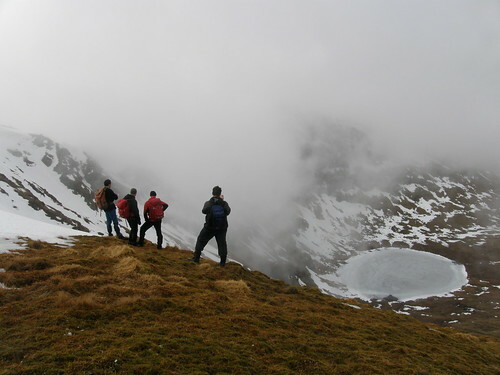 From that top we followed the rim of Coire an Duich, the cloud drifting in and out giving some views and often seeming to be about to lift. 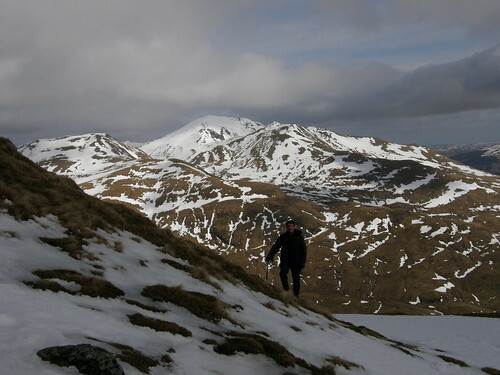 Whilst the others stuck with the path up the Munro top of Sron Chona Choirein, Geordie Munro and I continued to follow the edge of the corrie. A very fine corrie it looked too and it was quite tempting to carry-on round and down via the eastern ridge. 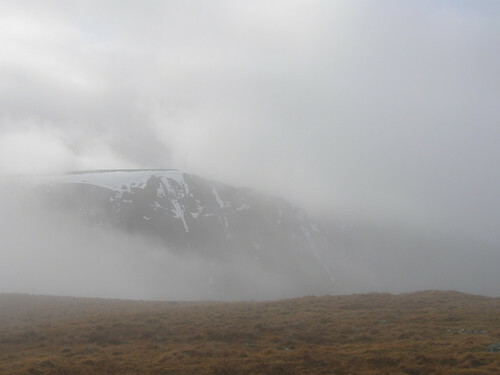 But the summit called and we joined the others and followed the main ridge, stopping to admire the frozen Lochan nan Cat when the cloud allowed us a view. Partial views were to be the order of the day. But it was great to be out. 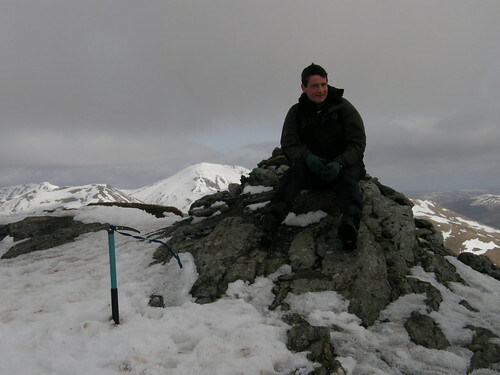 Stuchd an Lochain (960m) was my first new Munro for…well I’m not sure how long for, but for a very long time. 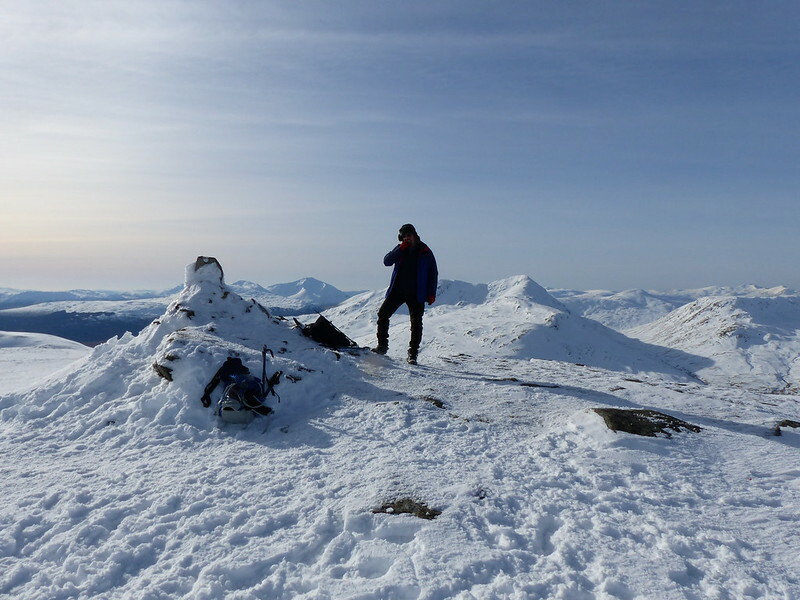 I’ve just done a quick count on my Munro’s map and it seems to be number 145 for me – although that takes no account of my dodgy record keeping and any messing around the SMC have done with the list in the last 10 years (I stopped paying attention). What I do know is that for my friend Robin it was number 2 after Meall nan Tarmachan last year. At this rate he may finish sometime in the 24th Century! 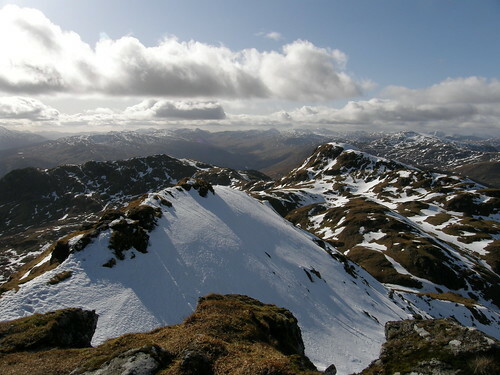 From the Meall an Odhar ridge we had tantalising glimpses of the neighbouring Corbett Creag nan Nathrach and not content with our Munro fix, we crossed some peat-hagged saddle and then climbed steadily to its summit. …and Pubil. 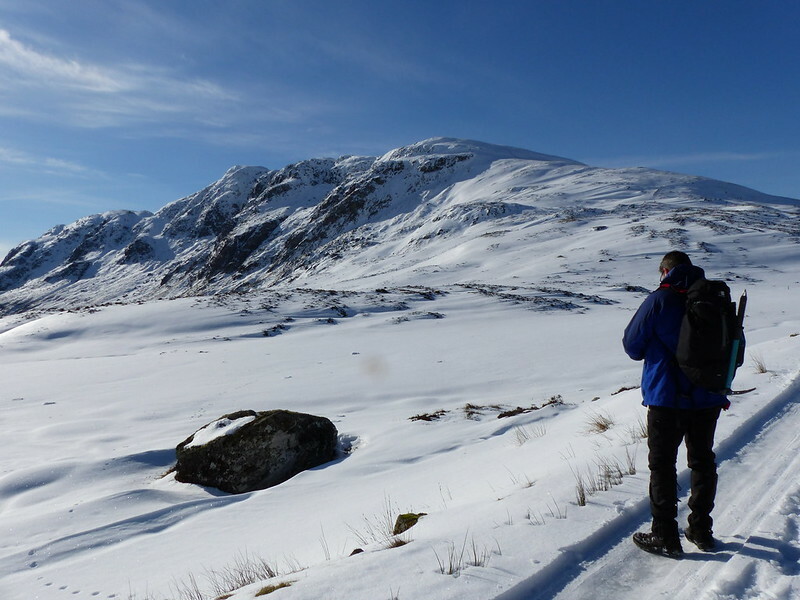 Whilst the faster walkers had taken the car to retrieve our other vehicles the tail-end Charlies followed down the valley where we discovered a memorial to Glen Lyon born explorer of the Yukon, Robert Campbell. A fifth annual weekend get together with old friends at the Ben More Lodge Hotel just outside Crianlarich. Last year both days walking ended for me, not without satisfaction, but with DNS (Did Not Summit) against my name in the record book. 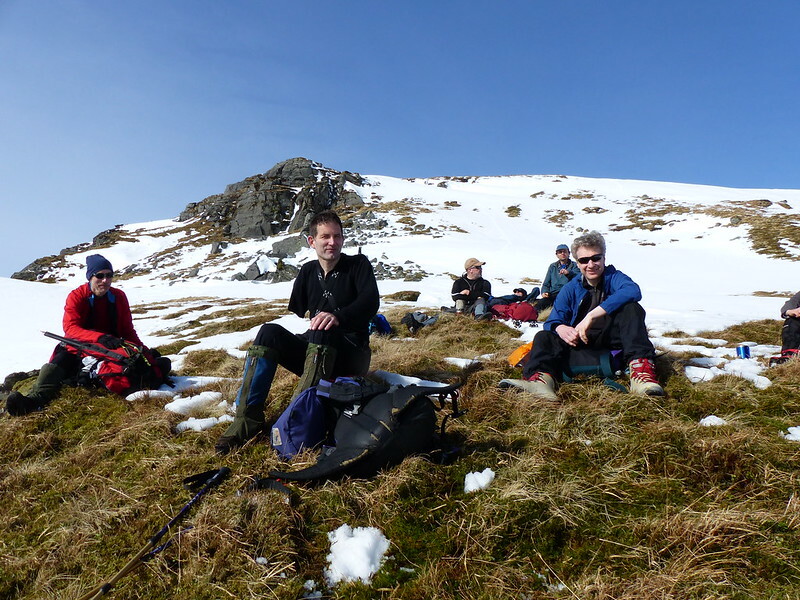 This time the Saturday was far more fruitful with great weather and a terrific traverse of part of the Tarmachan Ridge. 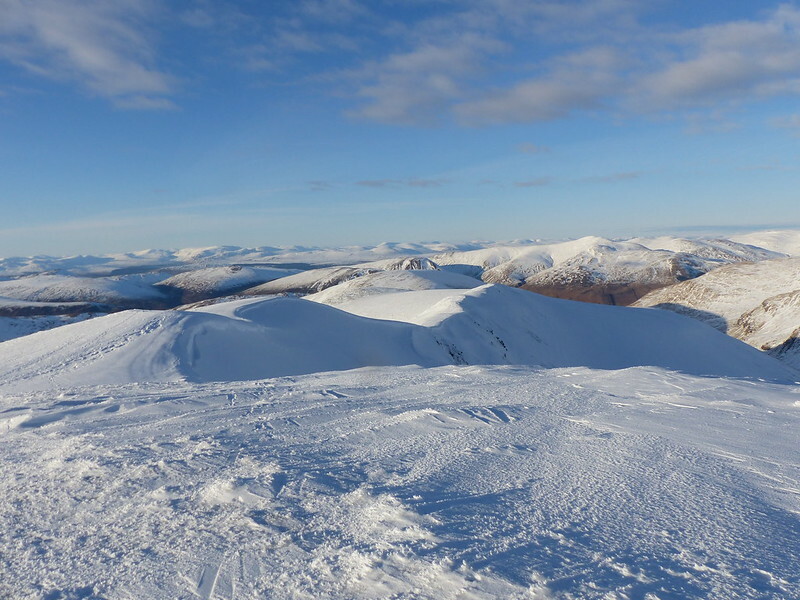 Most of the party were taking the opportunity to ski on the couple of Munros on the North-Western end of the Lawers ridge, or to traipse along in the wake of the skiers, but being without the benefit of touring skis R and I decided to tackle the more interesting hills across the pass. 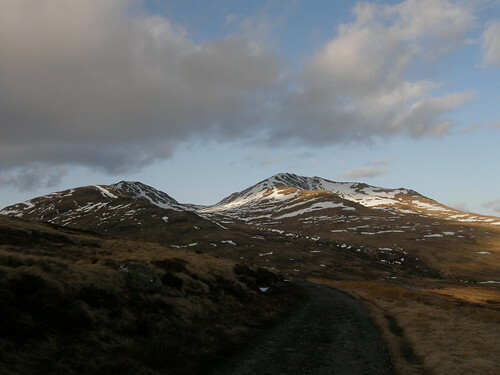 After the initial excitement of the lizard spotted amongst the moss (see previous post) an excellent path gave us a pleasant steady climb (at my usual snail’s pace) towards Meall nan Tarmachan’s southern ridge. 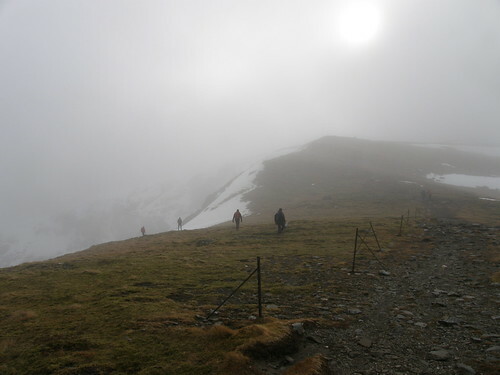 As it turned out, after one steep climb the remaining steep and corniced section could be bypassed on a broad shelf which rose gradually to the summit ridge. R posing after the first steep section. It was surprisingly windy on the top, given that it had been very calm up to that point, but I think that R was enjoying his first Munro. 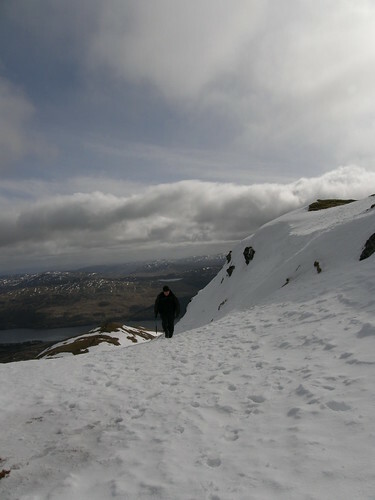 From here a short descent and a short but occasionally steep climb brought us to Meall Garbh. …which if not quite a ‘knife-edge arête’ is at least sufficiently sharp to add a little spice to the crossing. 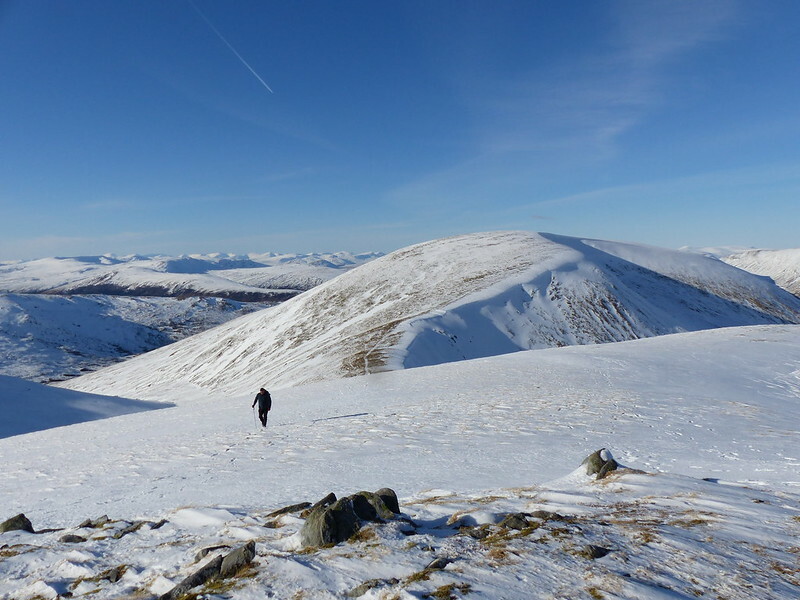 I didn’t ought to have been ‘unsuspecting’ since I’ve been this way twice before – admittedly both of them many years ago – but I must confess that although I remember enjoying both days on the ridge (one summer, one winter) enormously, I didn’t have any recollection of this part of the route. 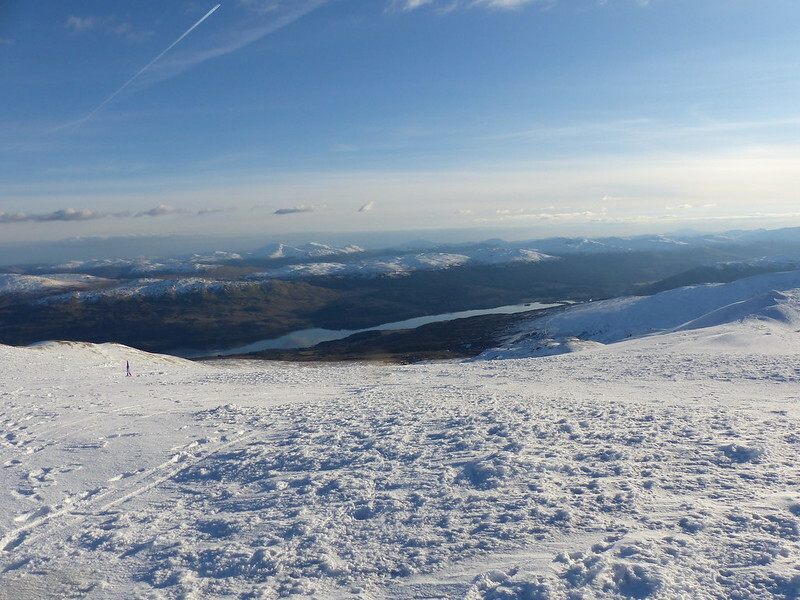 The views by now were fantastic, particularly of nearby hills such as Ben More and Stob Binnein to the west and Ben Vorlich and Stuc a’Chroin across Loch Tay to the south. We had some difficulty descending the next part of the ridge which was briefly very steep, icy and rocky. After a bit of a false start, a re-ascent and eventually a flanking manoeuvre with some step-kicking and a short bum-slide, we eventually made it down to the coll. Whilst we were trying to negotiate the difficulties, I was temporarily diverted by a pair of birds, small and dumpy which kept low to the ground and which I didn’t recognise. They may have been snow buntings, but I’m not sure. For what would have been an easy finish along a landrover track back to the car, except for the cramp which finally did attack. In fact, this wasn’t quite the end of our days walking because we took a short stroll along the western end of Loch Tay, near Killin, to seek out a geocache there. I feel slightly responsible – I think that I introduced R to the idea of geocaching and now he is a man obsessed. 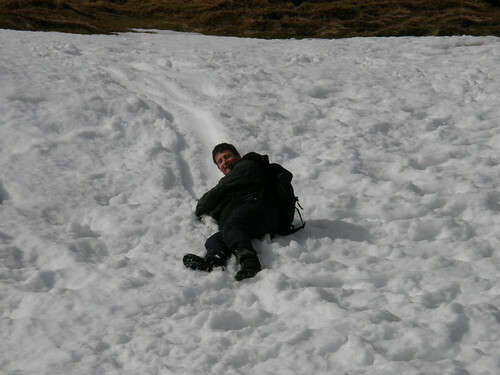 Now if started him on Munro bagging….oops!